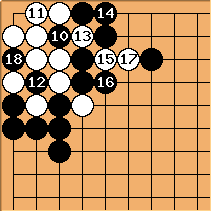 The butterfly formation results from making not one, but two large knight's moves from the corner starpoint. 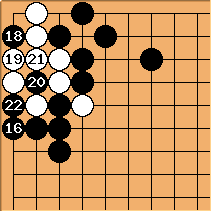 It is generally considered to be inefficient, since as it stands the 3-3 point invasion succeeds, while its two wings don't radiate as much power as wider enclosures would. 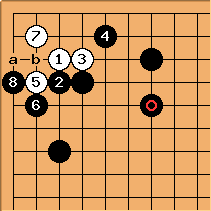 This shape is referred to as Kannon-biraki in Japanese. Kannon is the Japanese name of the Buddhist goddess of mercy (Sanskrit Avalokiteshvara). In everyday speech, Kannon-biraki refers to a type of double (or "French") door, originally used in cabinets containing images of the goddess. A duller name would be 37-44-73 enclosure. This is one of a number of unusual three-stone enclosures that are being seen more frequently in pro games. 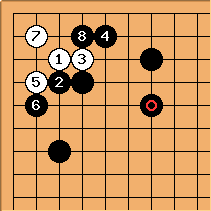 This sequence occurred in a game of Dosaku (in 1678) and also in a game Yu Bin-Seo Pong-su in 2000. at a, at b, at c sets up a ko; if White wins the ko the damage to Black's position will be serious, so this may almost be a picnic ko from White's point of view. 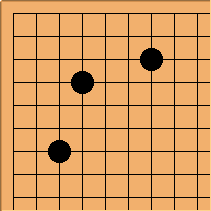 If White really wants to avoid ko, she could play here, in place of c, for unconditional life. at looks intimidating, but is an overplay. is the answer. is forced, whereupon threatens bent three life, requiring . 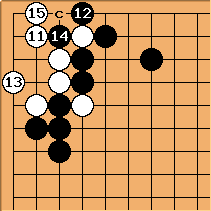 Now White unleashes , forcing due to capture three to get an eye. After the cut of , Black is in pieces. 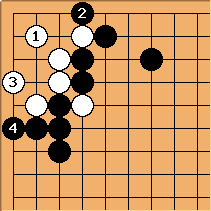 Query part I: Following the previous sequence but without playing the eye-steal - This is still a better reduction than the second diagram isn't it? 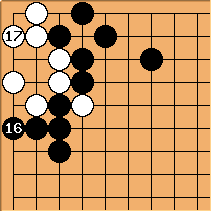 In practice, Black probably played at least one of the marked stones as a checking extension against a corresponding white stone. 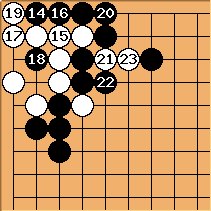 That makes the marked points interesting as possible invasions for White: if they connect out, a weak white group will gain in strength. Black 1 here is the normal idea. 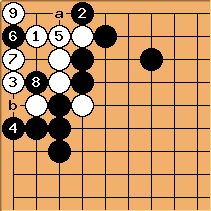 The invasion point at a is then just some bad aji, not something White can use successfully at once. 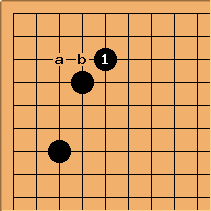 b in place of is solid play. spindizzy1976 This is a situation which I have been caught in recently, where I tried to invade in a 2-stone handicap game. At first glance it looks like playing at a might give a ko, but actually maybe not? Anyway, I connected at b and ended up dying. Can anyone suggest what I should have done? Is it impossible to invade here? kb: Playing at a gives a ko. 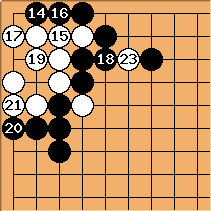 It is probably your best option here - especially if Black is strong on the outside (Black has at least the marked stone supporting the butterfly formation). You can try to run but most likely you will be cut and die. If you are strong in the surrounding area, go ahead and run - punish your opponent for their overplay at . If Black is strong on the outside, can he not play to kill instead of ko? What if Black plays as shown here? How do we live unconditionally? A and B miai for life. Looks like a two-step ko. Apparently a non-standard term coined by Charles Matthews. Not. The term has been around for decades.